This free, lunchtime concert series features local artists selected by our very own Sunset Center staff members for a truly for locals, by locals feel. 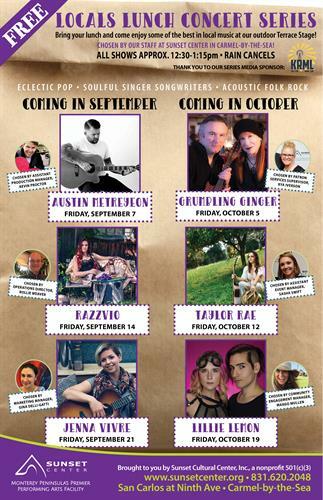 The series kicks off on Friday, September 7, 2018 from 12:30-1:15PM with blues, rock guitarist, singer-songwriter standout Austin Metreyeon. Everyone is welcome and encouraged to attend - no tickets or reservations required. Let's start the weekend off right... we'll see you here at our beautiful, outdoor Terrace Stage at Sunset Center in Carmel-by-the-Sea!